From there the trail began a climb up through the woods and then opened out into a field. One of the Alley Cat crew members told me he had mowed here so I didn’t have to wade through tall grass, however the trail apparently had seen some horses and was a little chopped up from their hooves. As I came up towards the crest of the hill fields opened up to the left and offered a great view. I stopped to take a few photos before continuing on. 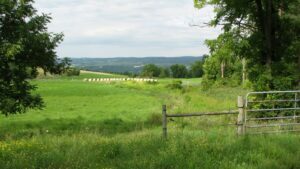 I topped the hill and crossed Satterly Hill Rd., which offered even better views and more photo opportunities. After crossing the road (mile 1.5 – 8:57 am) I walked down through some old abandoned vineyards (now part of the Finger Lakes National Forest) and into the woods. 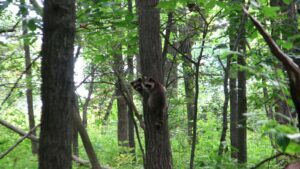 As I walked along I heard some noises to my left and saw a raccoon family. They quickly scooted up a couple of trees. 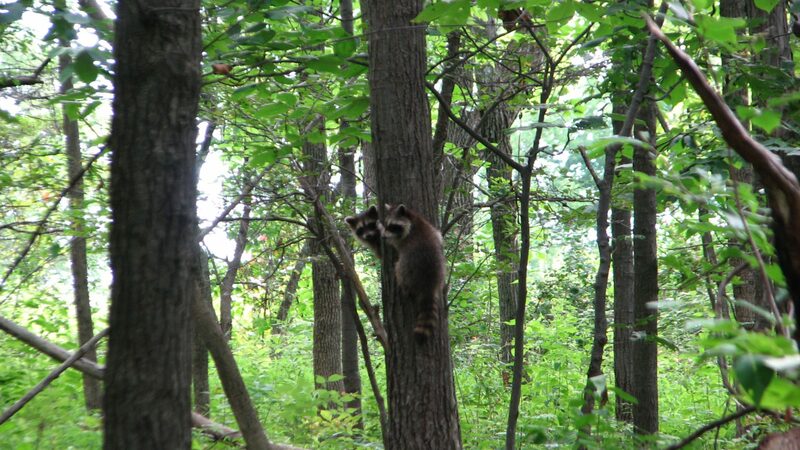 I snapped a quick photo of the raccoons and continued on down the trail. The trail came down onto an old railroad bed and turned to the left (mile 2.5 – 9:20 am). Now that I was out from under the trees I could see that the sky was beginning to cloud up. The railroad bed was very wet and swampy in many places and I had to weave around and pick my way carefully, even then I still did have to slog through some muck, fortunately it was not deep and my feet stayed dry. The old railroad bed opened out on to a small farm road. I saw old farm equipment left to be overgrown along the sides of the road (mile 2.9 – 9:30 am). As I continued along I passed between pastures for cows and sheep and then down into a wooded area and past an old mobile home trailer which might have been used as storage at one point, but was now damaged and decaying. The mosquitoes were bad now and I was swatting and being bitten often. 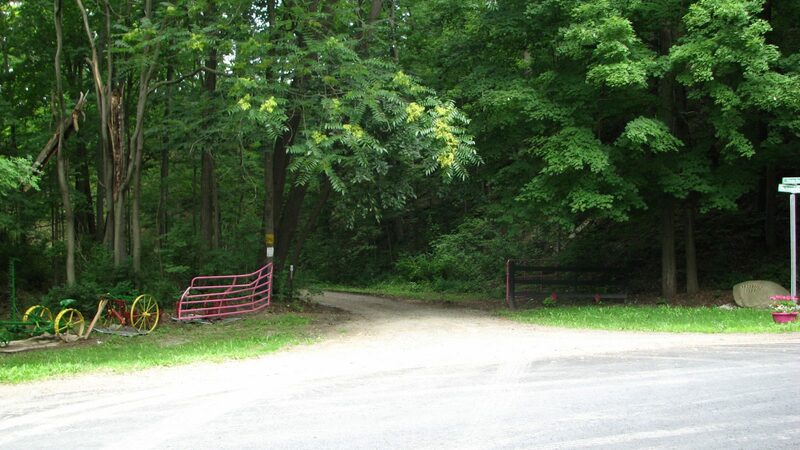 The farm road ended at Satterly Hill Rd again – this time further down and next to the “Twin Tunnels”, (mile 3.3 – 9:39 am) an old railroad underpass with two tunnels, one for the road and another for the stream. I took a photo of it, but was rather hurried due to the mosquitoes and didn’t get my camera set correctly, so the photo was too blurry to keep. Satterly Hill Rd wound along past some houses, in front of one house a tent was being set up for a party later in the day. 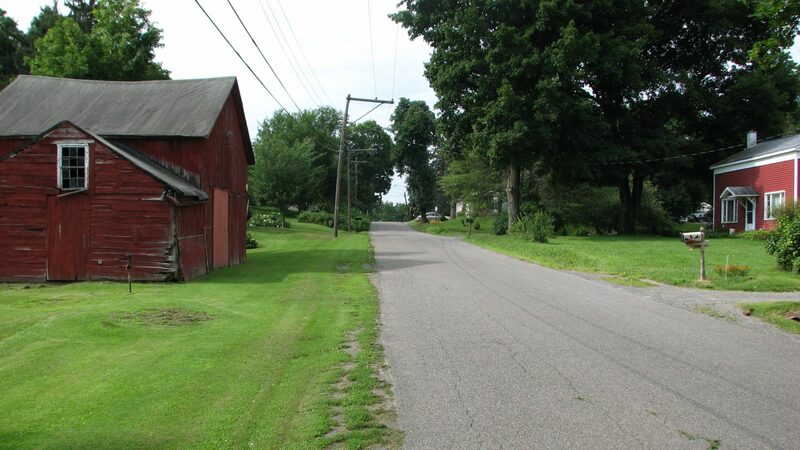 The road continued on into Burdett, NY where it changed its name to Willow St. I turned left off Willow St. onto Main St and then right on to Mill St (mile 4.0 – 9:52 am). On the corner was Berta’s Cafe. There were some people sitting outside enjoying their meal at the outside tables and I could smell the wonderful smells coming from within the cafe. I continued following Mill St along as it changed from pavement into dirt and gravel and also changed its name to Middle Rd. The road steadily descended and it soon opened up to offer a nice view of Seneca Lake (mile 5.6 – 10:24 am), by this time it was fully clouded over and looked like it might rain soon. I met two other hikers coming the other direction up the road. The two guys were doing a multi-night camping trip and had started west of Watkins Glen the day before. They were on their second day and planned to spend the night at the Dunham Lean-to which I had stopped at back in June. I told them what to expect from the trail ahead and what I remembered of the lean-to and wished them luck and continued on down the road. The trail then turned left off Middle Rd and headed up and through the woods (mile 6.0 – 10:37 am). After a quick climb I found myself out on the edge of a busy road, Rt 79. I waited for a break in traffic and quickly crossed over to Jolly Rd and continued the climb up to the next trailhead. 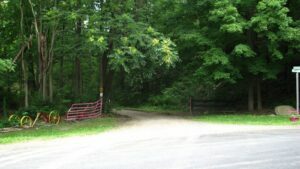 The trail turned right off Jolly Rd and headed down towards Excelsior Glen. 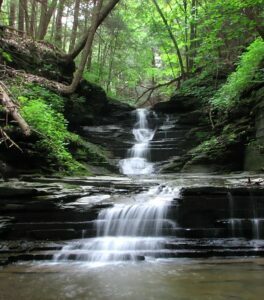 After a short walk I found some incredible waterfalls (mile 6.9 – 11:10 am). I carefully climbed down to the stream from the trail and spent a time taking many photos. I walked down the stream a ways and found that there was a drop-off where the stream tumbled over to formed a waterfall. I carefully made my way near the edge and took a few photos looking down. 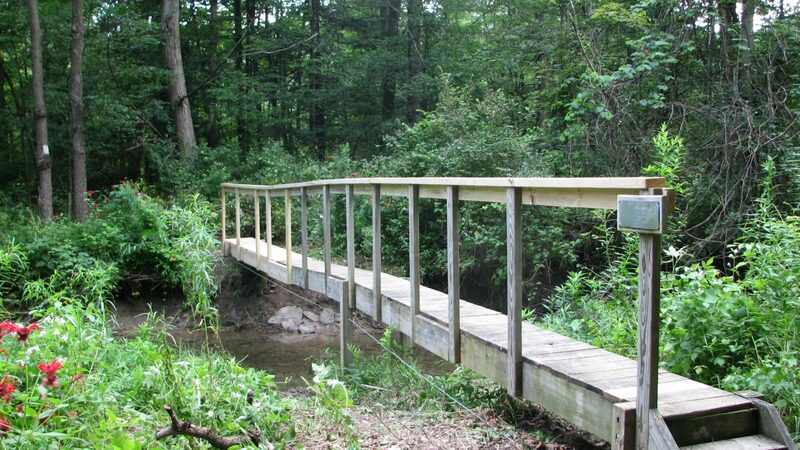 Then I climbed back up to the trail and wound my way down to where the stream crossed under NY 414. I walked back upstream and found a different waterfall than the one I had looked over earlier and took some more photos. Finally having taken enough photos I headed back downstream and up on to NY 414 (mile 7.9 – 11:57 am). From here I walked down the side of the very busy road and headed into Watkins Glen, NY. Lakeside Park opened up on the right and I crossed the road after waiting for what seemed several minutes for a break in traffic. I walked through the park until I reached the canal and then headed back up to the road, now there were sidewalks. 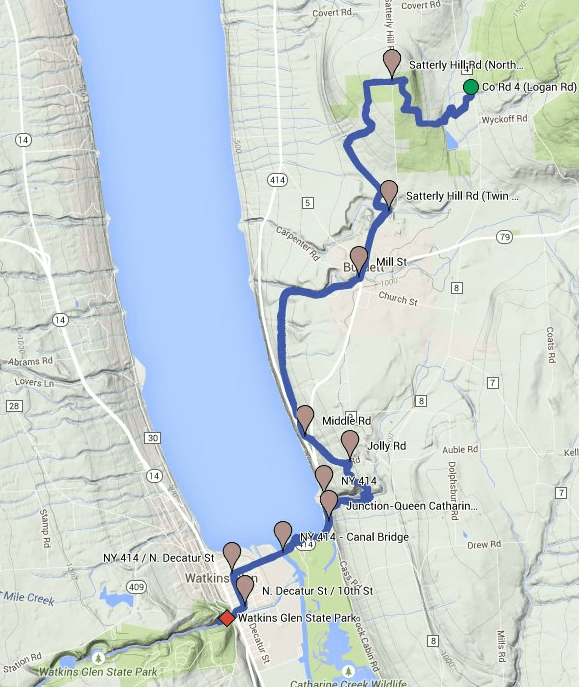 I continue on into downtown Watkins Glen and turned the corner at N. Decatur St and NY 414 (mile 9.2 – 12:23 pm). Lafayette Park is on the corner and there is a concrete sign for the Finger Lakes Trail here. I followed N. Decatur St. on until I reached 10th St and turned right. 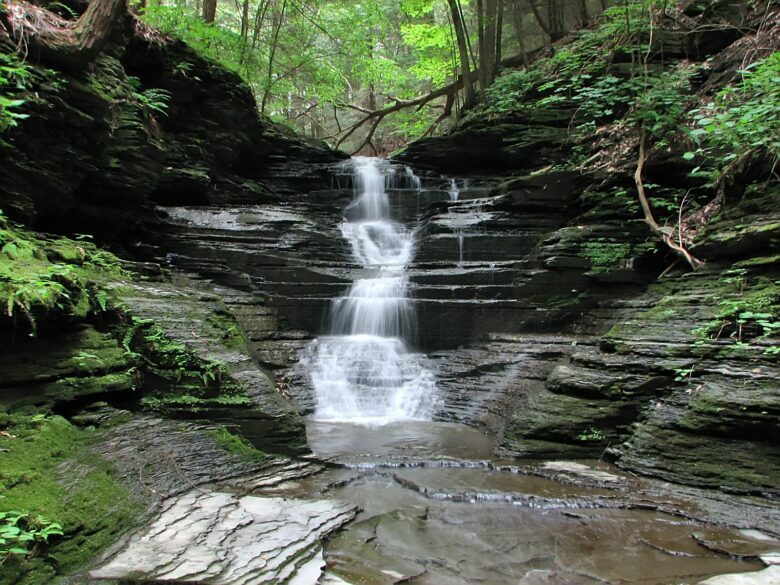 I came to the busy road of NY 14/NY 414 and the main entrance of Watkins Glen State Park. After pressing the button for the crosswalk signal I crossed along with a number of other people who had come to visit the state park and headed up to the end of the parking lot to where the main walkway through the gorge begins. I sat down and had some water and watched the tourists coming and going up and down the main path (mile 9.8 – 12:36 pm). After resting for a few minutes and drinking some water I checked the weather radar on my phone and saw that some rain was on its way and decided to get moving and try to make it to one of the parks and find some cover; I made it to the corner of N. Decatur and 9th St. Fortunately it was only a light sprinkle and didn’t last very long. I passed back by Lafayette Park and continued on to Lakeside Park. I reached Lakeside Park and found an empty pavilion towards the east side of the park where I could stop and have lunch and take my boots off for a short while (mile 11.3 – 1:16 pm). A wedding party was nearby taking photos. While I was eating my lunch the rain started again and the wedding party scrambled for cover under the trees – umbrellas quickly came out too. The rain passed quickly again and the wedding photographer wanted the bride and groom to walk out onto a rock jetty, but with the rain it had become slick and they turned around after only a little ways deciding it was best not to try it. After resting and enjoying my lunch I reluctantly put my boots back on and I started back up towards Excelsior Glen. This time I did not stop to take any photos and after climbing through the glen I found myself back out on Jolly Rd (mile 12.8 – 2:34 pm). I followed the road down to Rt 79 and again waited for traffic to be able to cross the road. Back on to Middle Rd and a slow steady climb up. I passed by the Walsh Lodge and saw a sign on a tree stating that the premises had been placed under the supervision of the state police; definitely didn’t sound like a good thing. The sun was starting to break through again and it was getting hot; much of Middle Rd is out in the open with no shade and the dirt and gravel help to reflect the sun and heat. I found a bit of shade near one of the overlooks and drank some water while a nice breeze cooled me (mile 14.0 – 2:56 pm). After a quick break I continued on up the road. The dirt and gravel gave way to pavement as I entered Burdett again, Berta’s Cafe was closed now; their hours were 7 am – 2 pm. I turned on to Willow St and headed out of Burdett and soon passed the house where the tent was being set up earlier, the party was going on now. As I approached I idly wondered if the party was for the wedding I had seen earlier; it wasn’t, but appeared to be a family gathering. I arrived at the Twin Tunnels and turned on to the farm road; the mosquitoes where still bad (mile 16 – 3:45 pm). I again passed between the pastures and this time I stopped to rest here and have some water and banana. Then on down the farm road to the old railroad bed and again wove my way around the puddles and swampy ground. After leaving the old railroad bed I headed back up through the woods and out into the old vineyard fields and finally back to to the top of Satterly Hill. I took a deep breath and paused for a few minutes, from here it was all downhill (mile 17.7 – 4:38 pm). Thanks again for another great trip report. 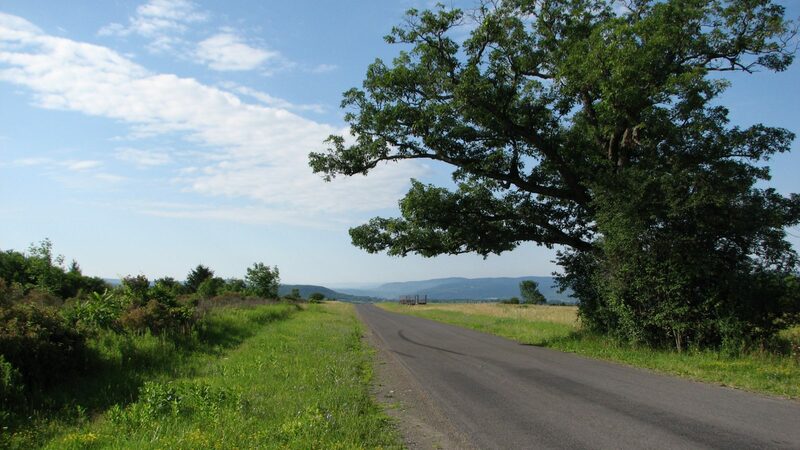 Decades ago I hiked part of it as the finish of an overnight in Finger Lakes NF (then the Hector Land Use Area) and remember the vineyards you say are now abandoned. No way I could do 19 miles anymore! Thanks for the comment Jon. My longest single day hike ever was 26.9 miles over some pretty flat terrain. Mostly I stick to between 15 and 20 miles. It is definitely a long day of hiking and I am tired and a little sore by the end. I enjoyed nearly the same hike late last week. 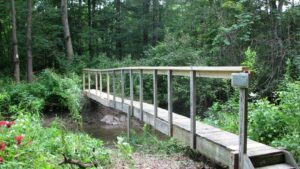 I started at Watkins Glen, hiked to a friend’s on Willow St. in Burdett, was driven to the east end of M16, then hiked back to Burdett (Wed, Thu, Fri). Glad to know they’ve fixed up that bridge; ’twas a bit wobbly when I crossed it. Muddy, wet sections along that old railroad bed looked like they’d take a while to dry out – no place for the water to go! I enjoyed your write-up and photos! Thanks for the comment Michael, I think I was probably the last hiker to go over the wobbly old bridge. The Alley Cat crew warned me the far side was wobbly and it definitely was. When I came back through it was nice and solid, they do great work. I agree on the muddy sections, I don’t think they would be drying out any time soon either. Glad you enjoyed the write up and photos.